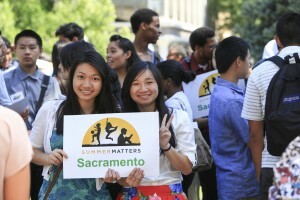 Busloads of students from around the state joined state education, business and legislative leaders at the state Capitol June 20 for the kickoff of the Summer Matters campaign to boost summer learning. “We’re gonna rock with summer learning this year,” State Superintendent of Public Instruction Tom Torlakson told the crowd of students assembled in front of the North steps of the Capitol, ready for the fun, literacy-themed activities to take place throughout Capitol Park after the rally. 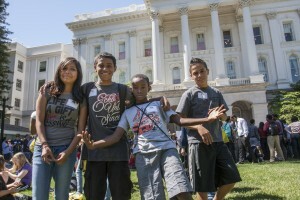 Summer programs give kids the opportunity to learn to work on projects with other kids and “to pursue something they are really interested in,” Torlakson said, telling the assembled students: “This is an important day and important week,” because the Legislature has “put education as a top priority” in this year’s budget. 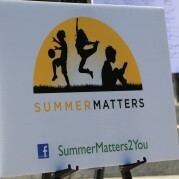 Besides Torlakson, Assembly Members Susan A. Bonilla and Sharon Quirk-Silva, Sacramento City USD Superintendent Jonathan Raymond and others, the speakers included Summer Matters business partner Sean Marx, CEO of Give Something Back, which distributed school supplies to the students at the rally. “As a California employer that is engaged in supporting vital education initiatives, we know that learning happens year-round and that high quality summer learning programs play an essential role in strengthening students’ academic success and overall health and well-being,” said Marx. McKinney said he expects to learn more about public relations and advocacy during the program, which required him to apply with a cover letter and resume just like a regular job. “They treat us like adults,” he added. Learn more about summer learning from Summer Matters, and download the three-part series to help governance teams design and implement summer learning programs on the CSBA website.